On the first Thursday and Friday of November our leadership team at Good Shepherd's Fold went to a place called "Prayer Mountain" for a time of prayer and strategic planning. 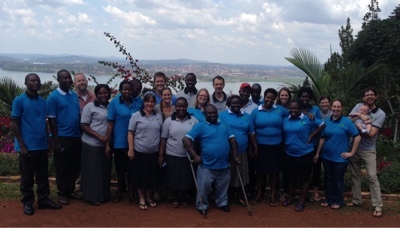 The leadership team is comprised of missionaries and Ugandan managers who serve together here at GSF. The two days together were good and we had time to discuss and pray over many of our core values and how we are doing at implementing these. We also had some time for prayer and thinking about goals for our particular area of ministry. As David and I were discussing our thoughts and goals regarding our life and ministry here we found that we both were feeling like adding anything more to our to do lists would be overwhelming right now. We are both a bit maxed out. Between both of us working full time as teachers having 5 or 6 seperate class preps each, both of us leading a cord group of 7 or 8 pre-teen to teenage kids here at GSF, David serving as an elder and sometimes preaching, me overseeing children's church on Sundays, David employing and supervising students for landscaping jobs on their school holidays, my work with the village Bible study and Buwundo Beads business, assisting with preparing for visiting teams, caring for the needs of our four children, trying to love our missionary team well, trying to make time for nurturing our marriage, and just dealing with the general stress of life overseas, we both are fairly certain that God is not calling us to add more to our to do list. Don't misunderstand; we are thankful for each of these opportunities to serve! We love the people we work with and are blessed to spend time with them! But we also see that we have not left much margin in our lives. As Richard Swenson describes in his book, Margin, our lives are a bit like a page with words covering the whole thing, edge to edge. Just looking at the page is overwhelming! As we prayed through and discussed these things, we considered where we might step back a bit. One of the things that has regularly come to our minds is that we could really use another teacher! We did add one teacher to our school this year, but we also added 14 new students, and some of our older students were needing us to add classes that we had not been teaching. All of this led to me going back to being at school full time and both of us needing to devote more time to class preparation. We are praying that God will provide another teacher to lighten our load either by taking some of our classes for us or assisting in some way. Over the years we have been here, and even in the year leading up to our move here, we have pursued several leads about possible teachers to join the work we are doing here. I cannot tell you how many times I have been hopeful that someone would join us, but in the end it has not worked out. We trust that God has had his reasons in each of these situations, but please pray with us that God will provide someone to lighten our load soon! As we discussed these things, I realized that our goals are things that only God can bring about. Here are three of our goals that we have been praying about which completely depend on God's provision, although there are of course things we need to do as we ask Him to provide. 1- We are asking God to provide another teacher. 2- We are asking God to provide the finances we need to build additional classrooms since the space we are currently using is needed for housing for the toddlers at GSF. 3- We are asking God to provide a way for us to take a day off periodically. We would love to have some substitute teachers who we can ask to cover our classes every once in a while so that we can take a day away for prayer, rest, or even just to get to offices in Kampala that are only open on weekdays. We trust that if these goals are in line with the direction God has for us, that He will provide. We ask that you also pray with us toward these goals. If God is leading you to be a part of the answer to any of these prayers, please contact me! If the Lord is leading you to contribute to our classroom building here is a link. Just select "Donate to the GSF International School." God has already begun answering these prayers! This past week a team of women came to visit GSF and encourage the missionaries serving here. One of the women who is a teacher offered to cover my classes on Friday morning for me to have a day off. It was beautiful to see this answer to prayer just one week after we had prayed for this! Of course this thoughtful visitor has gone back home, so we are still praying for an ongoing solution. We also received notification from Global Outreach that we have already received two donations toward the new school building! We are so thankful that God is beginning to provide for this need! And lastly, I have the name of a teacher who might be interested in serving with us. While these prayers and goals have not been completely answered, we are thankful that God seems to be at work in each of these areas that we are asking for His provision. Thank you for praying with us as we seek to follow where God leads us, trusting Him to provide everything we need!